CBS did the right thing with this week’s episode of Survivor by basically merging two episodes in to one. As the ex-Ometepes simply pick off the ex-Zapateras with their numbers advantage – old Survivor style – there’s not much to watch. Rather than waste our time with sorry attempts at cliff hanger votes through creative editing, the Survivor producers hit fast forward on the season and got rid of two of the Zapateras this week. With three people left to vote out before the ex-Ometepes are left with their six, perhaps we’ll see the same thing next week. However, there’s the potential flaw in doing so. If only one Zapatera is voted out next week, do we know that there will be fireworks the following week? Allegedly the seasons of Survivor (and most reality game shows) are required by law to be planned out ahead of time. That is, the producers can’t manipulate the planned facets of the game after the game has started to get what they perceive to be a more favorable outcome. Not sure what this is all about? Read the 1960 amendment to the Communications Act of 1934. Or, just watch the movie Quiz Show. 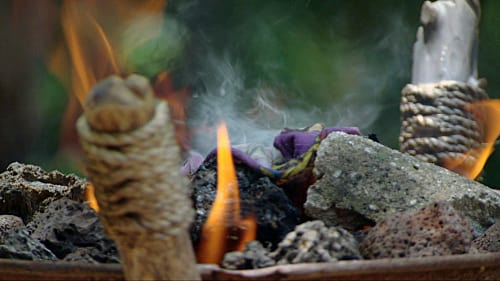 Getting back to the point, with most (if not all) of the competitive aspects (what challenges happen when, timing of twists, etc) of each Survivor season planned out ahead of time, Survivor’s producers decided ahead of time that there would not be a duel until at least three castaways were voted out. In fact, we’re not even sure that there will be a Redemption Island challenge next week. 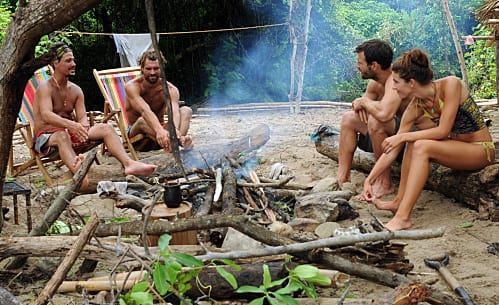 Assuming that the producers didn’t oddly plan a three-man challenge for next week and get lucky when these two tribal councils were boring, my guess is that there will only be one Redemption Island challenge for the right to get back in the game. Whenever it comes will incorporate every person who’s been sent to Redemption Island to that point with just one winner. Sticking with that theme, I’d wager that the challenge will be an endurance based challenge as well. Even though we had two weeks worth of challenges and tribal councils in just one episode, the lopsided nature of the game leaves little to discuss from a strategy standpoint. David even commented that it’s frustrating to be in Survivor when no one wants to play the game. What the Zapatera tribe members continue to fail to realize is that they’re not going to be able to just walk up, propose a scheme and get a yes on the idea. The best way to infiltrate their ranks is doing the exact opposite: becoming friends. Phillip even gave Ralph and out this week suggesting that they talk about their lives, but not the game. Neither Phillip nor David jumped at the opportunity. The only person who seems to know the value of a bond prior to an alliance is Boston Rob. He recognizes that he can’t let his tribe become friendly with the ex-Zapateras. Is he a bit extreme with his control, such as with the fish this week? Probably. But the flip side is that they’re all listening to him as well. As Grant said, he makes his own decisions. The rest of them could have done the same. One man who believes he makes his own decisions is Phillip. Whether anyone feels that he’s making his own decisions is up for debate. Phillip claimed this week that he recognizes that being the ugly duckling gives him a very good chance to get to the finals. I agree, it does. But does it give him a good chance to win the finals? I don’t think so. Even if he’s truthful and fully knowledgeable that his act is a way to get to the finals, is anyone going to buy it? As Herm Edwards said, you play to win the game. Is getting to the finals and losing to Boston Rob a success? In Survivor it’s always harder to know if one way or another would get one to the finals and/or to a win. I’ve always been a proponent of extending the game, to use a football term, and that’s what Phillip’s doing. But the implication in football is that you have a chance to win. 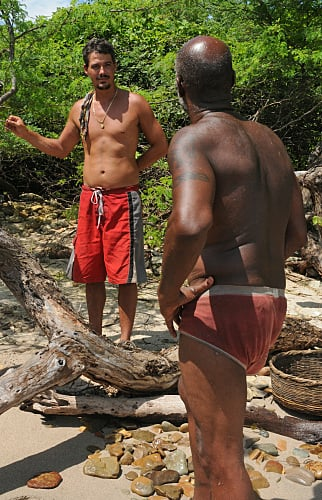 If Phillip doesn’t have a chance to win, is he extending the game or delaying the inevitable? The innuendos this week were great. Ometepe’s/Boston Rob’s move to get rid of Matt being called a mob hit. The multiple army references by Boston Rob with respect to Phillip and the other ex-Ometepes. Mike calling Boston Rob a prison guard. Rob calling Steve a dying T-Rex. Julie referring to the ex-Ometepes as a cult. Great stuff. Julie thought that sending Matt back to Redemption Island was cold blooded. Come on. It’s a game. There’s nothing inhumane about sending him back. Besides, she doesn’t know what Matt told Boston Rob was the impetus for the ouster. It’s hilarious that the two former tribes have separate shelters. That has to be a Survivor first. I’m coming around on Phillip. Not in a real way, but in the sense that he’s a parody at this point and every time he opens his mouth, it’s more ridiculous than the last thing he said. Jeff also knows what a joke he’s become and clearly eggs him on.